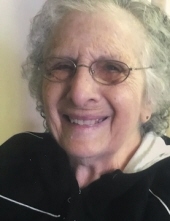 Anna T. Herman, 89, of Kutztown, passed away, Sunday, March 24th, at Kutztown Manor. She loved to watch her grandchildren, go to flea markets and yard sales and loved to cook, especially baking Christmas cookies. a brother, Louis Zangari, of Lancaster. A special thank you to the staff at Kutztown Manor, Inc., for their care over the last 5 years. In lieu of flowers, contributions maybe made to: St. Jude's Children's Research, 501 St. Jude Place, Memphis, TN 38105. Services are private at the convenience of family. The Sanders Funeral Home & Cremation Services Inc., 1501 North 11th Street, Reading, is in charge of the arrangements. Interment will take place, at a later date. Online condolences may be made at www.sandersfuneral.com. To send flowers or a remembrance gift to the family of Anna T. Herman, please visit our Tribute Store. "Email Address" would like to share the life celebration of Anna T. Herman. Click on the "link" to go to share a favorite memory or leave a condolence message for the family.